This is the first time I've collected cards that were given away at a baseball stadium. 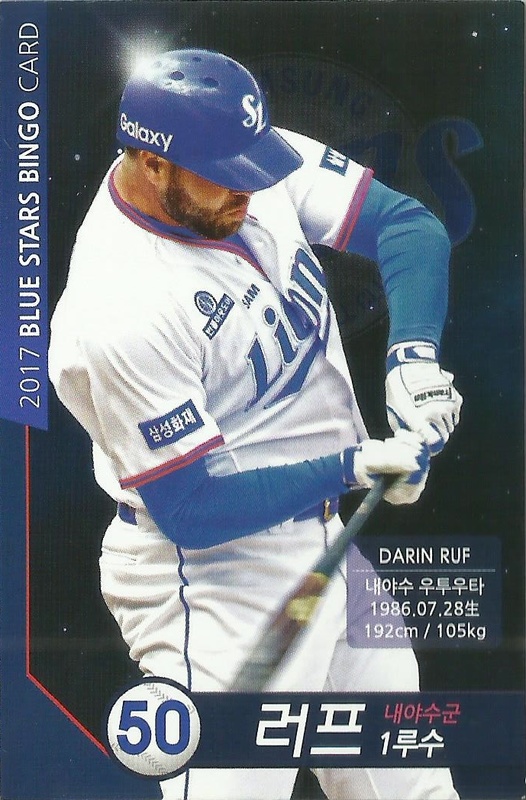 This 2017 Samsung Lions set is made up of 30 cards total, one card being a Lucky Blue card related to the bingo game. These cards were randomly given away at the game after you entered the stadium. 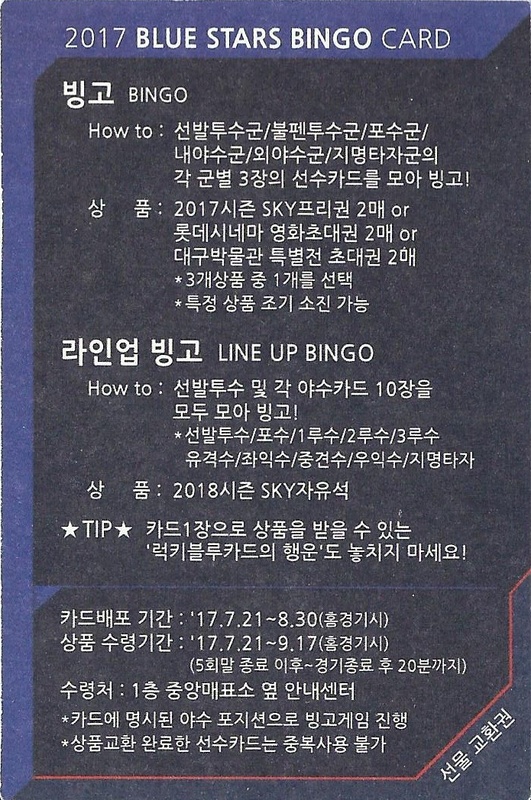 The cards were given away from July 21 - August 30. The cards are numbered on the front with jersey number. All cards have the same back with rules of the bingo game. 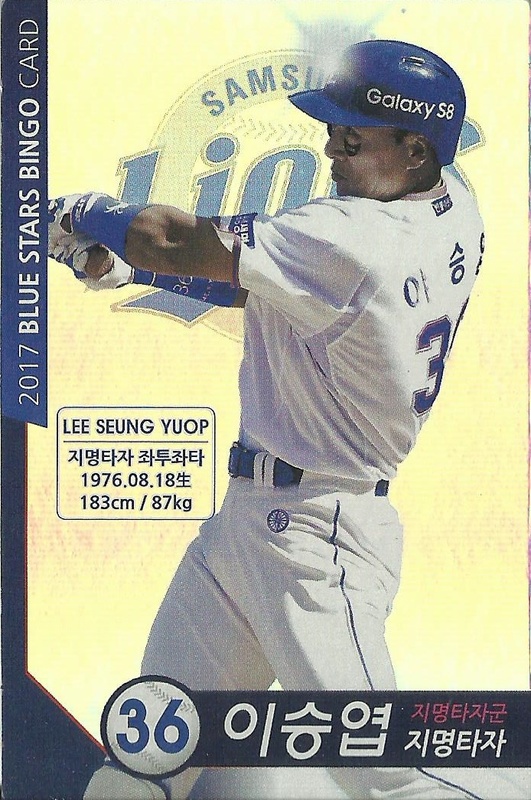 The fronts are also similar with the exception of Seung-yeop Lee's #36 card, which includes a hologram look. At the moment I have 29 of the 30 cards. 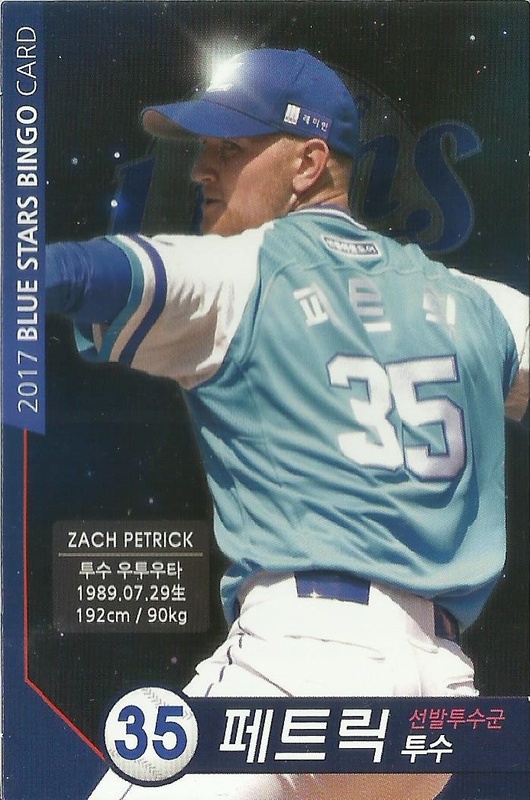 Sadly, I had to give up the Lucky Blue card (a beater I received in a trade with a kid) for a Han-Yi Park card I was searching for. My friend John is a season ticket holder and was able to acquire the set plus others, which he traded me for my upcoming foreigner set. We believe the Lee card is a short print. 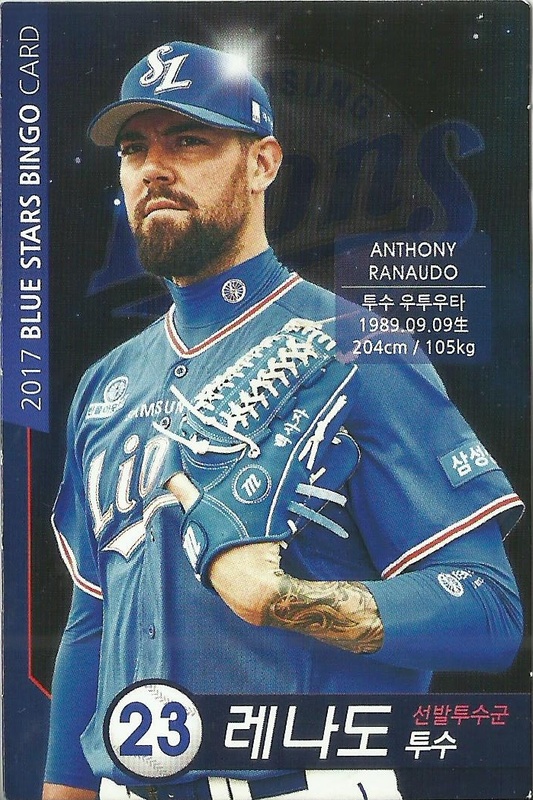 This set incudes all three foreigners on the Lions this year: #23 Anthony Ranaudo, #35 Zach Petrick, #50 Darin Ruf. NOTE: I am posting this with one or to more games to attend this week to try and acquire the Lucky Blue card (NNO) to complete the set. Admittedly, I can be a bashful person but last night I was walking around the stadium looking for people willing to trade or sell their cards. Sometimes I'd see a kid with a stack of cards and I'd be like "Wow!" and try to trade with him. I keep these cards in semi-rigids and I had extra holders. I was even able to trade the semi-rigids 1 for 1 for a player card because they don't sell them here in Korea. I'm anxious because I really want the Lucky Blue card so I can complete the set in full. Hopefully I can acquire it tomorrow night at the game, the final day of the card giveaway is Wednesday, the 30th. I may try to go Wednesday to acquire additional cards or search for the Lucky Blue if I don't find it Tuesday. It would of been nice if the Lions would of made this a Team set and made it a give away all season and then you could of traded with other fans in the stands to try and complete the set. 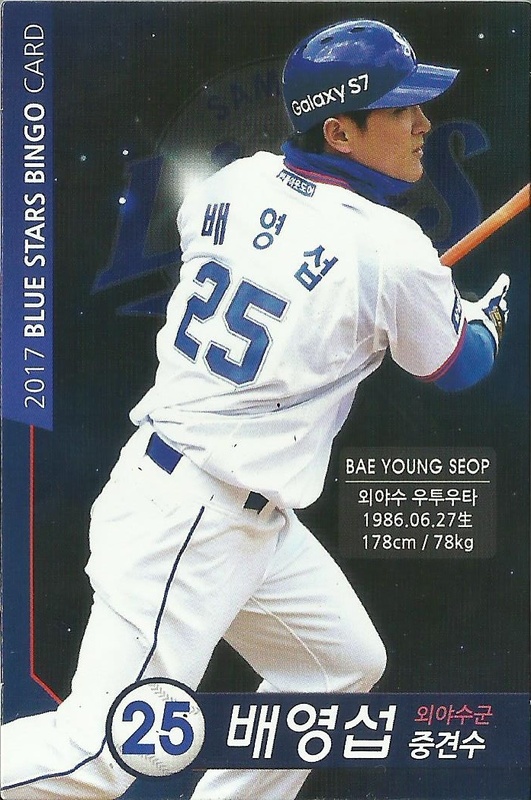 They do it in MLB and there are other teams in the KBO that have found it a good promotional item to boost support for there team and fans in the stands.